When Doctor Who returned to screens in 2005 it revitalised Saturday night family viewing. 12 years on that concept seems to have evaporated. Television has changed immeasurably over the last decade. But how is Doctor Who performing in this new era of television? On-demand and streaming services have become more accessible to audiences of all ages. The laptop has overtaken the PC. Tablet computers have also made watching on-demand and streaming services even more convenient. Major television events still draw in large viewer numbers, but these are often sporting occasions. General television programming, irrespective of genre, can be easily accessed on a catch-up service so the necessity of watching ‘live’ has been eroded. Soap operas perform strongly, largely due to the regularity of their broadcasts. Viewers try to watch on initial transmission because they don’t want to fall behind. If they do it can be time-consuming to catch-up again. Despite this even the trusty soap opera big guns have seen their viewing figures slide in recent years. The advent of Freeview and the turning off of the terrestrial signal has expanded the number of channels available to even those without satellite subscriptions. Those days of two, three or four channels to choose from is long gone. Add on-demand, streaming services, video games, social media and the internet then it is inevitable that the quantity of viewers actually watching television has reduced. Doctor Who episodes being watched by 16 million people because there is nothing else on simply isn’t possible anymore. So in that context how is Doctor Who performing? Firstly, whenever discussions about viewing figures are presented lots of figures are thrown around. Media outlets in search of a news story often cite the quickly released overnight figures that record how many people watched the live transmission. 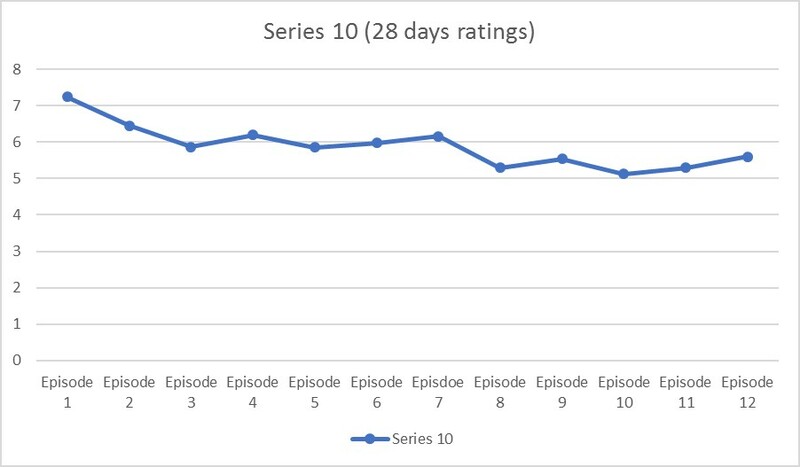 However in the new environment of catch-up and on-demand a more accurate representation of ratings can be found by analysing the viewers who watched the programme within 7 and 28 days of broadcast. This strategy also removes other factors that can affect live overnight figures such as the weather, the varying start time or major events occurring simultaneously. These figures do sadly demonstrate a decline from the most watched episode, the widely promoted season opener ‘The Pilot’. This is not uncommon as previous Series of Doctor Who have demonstrated. However, there is a consistency to these ratings. Over 12 weeks between 5 and 6.5 million people tuned in to watched Doctor Who on transmission or within the next 28 days. Having a consistent, faithful audience is an asset to any show. What will be interesting to see now is if that faithful audience will increase or reduce with the casting of Jodie Whittaker, the first ever female Doctor. So how does Series 10 fair against those series which have been broadcast since 2005? 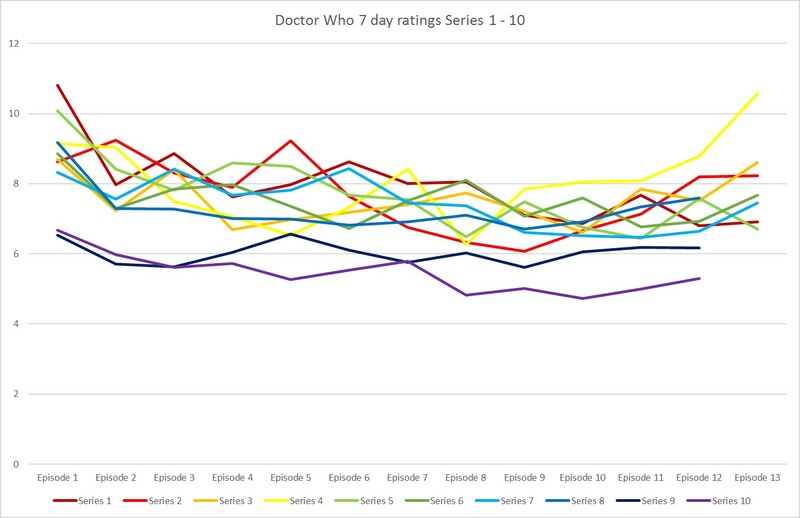 As you can see from the above chart, recording the 7 day viewing figures from Series 1 to Series 10 and ignoring special episodes, the most recent two series are noticeably below other years. In terms of the raw figures Series 9 and Series 10 are clearly less. But the truth is that viewing figures for all shows are down, even the soaps. Eastenders figures were reported as being down 5%, Coronation Street down 3% and Emmerdale down 4% on those recorded in 2016. This is why it is important to consider the context discussed earlier. Television is positioned in a very competitive environment so whilst these figures are disappointing we must be careful not to give them undue precedence. Whilst other media outlets are quick to knock recent ratings for Doctor Who they are not presenting the full story. Doctor Who has a faithful core audience in the UK who regularly watch the show. We must not forget that the show is also watched all across the world. Whilst numbers and statistics don’t lie, they are simply not the full story. Assistant Director (uncredited) on Doctor Who episodes ‘Dark Water/Death in Heaven’, ‘Last Christmas’, 'The Return of Doctor Mysterio' and ‘Thin Ice’. A fan and collector since 6 years of age having watched Doctor Who repeats on BBC2. Equally enthusiastic about Torchwood and The Sarah Jane Adventures. Lucky enough to own original costumes worn by Freema Agyeman, John Barrowman and Elisabeth Sladen. Author of a book chronicling the history of Doctor Who exhibitions coming soon from Telos Publishing. I totally agree and for the most part the days of of the whole family gathering around the living room TV ( probably the only TV in the house at that time) are long gone and live TV schedules dictating our programme watching is an outdated concept. As you have said the important thing is that Doctor Who has a loyal fan base in the UK and is one of the BBC’s top exports across the world. The BBC is in the unique position of not relying on advertising to fund it so ratings on it’s own should not really determine the future if the show. What about the effect of longer wait times between seasons and later start times (at last in US)? These certainly have affected the marginal viewership. A really great read. Thanks for putting this in perspective. I was part of that core viewership but stopped watching 3 episodes in to season 10 because the BBC and show have become more concerned with pushing their political agenda than making entertaining television. Season 11 will start with decent figures do to curiosity but I expect them to fall away quite quickly as more and more people tire of the leftist progressive propaganda which has replaced a classical liberal message the show was always known for. The BBC as an institution really needs to be dismantled.